There are many Dalit writers who have tried to expose oppression through their literary works. Some of them had to change their names so that their caste could not become an obstacle in their forward journey. One of them is Manoranjan Byapari who changed his surname to conceal his identity as Dalit Namashudra. In his autobiography 'Interrogating My Chandal Life: An Autobiography of Dalit' (Ittibrette Chandal Jivan) , translated by Sipra Mukharjee, he talks about his traumatic life as a child in the refugee camps of West Bengal. He says, "Here I am. I know I am not entirely unfamiliar to you. You have seen me a hundred times in a hundred ways. Yet, if you insist that you do not recognise me, let me explain myself in a little greater detail, so you will not feel that anymore. When the darkness of unfamiliarity lifts, you will feel why, yes, I do know this person. I have seen this man." The book describes about his life in the forest of Dandakaranya, involving the Naxalite movement and educating in prison, and his childhood as a boy running after cows and goats with a stick. Byapari was born in Barishal, Bangladesh, in 1950 and his family migrated to West Bengal when he was three years old. His family was forced to move from initial refugee camp in Bankura to a camp in South 24 Paraganas. He left his home at the age of 14 and undertook a number of low paid jobs in Assam, Lucknow, Delhi, Allahabad, etc. He shifted to Kolkata in 1973 after two years stay in Dandakaranya. He was associated with Naxals for some time. He had a close relation with Shankar Guha Niyogi. While working as a rickshaw puller, he met Mahashweta Devi, who asked him to write for her 'Bartika journal'. He is possibly the only convict-turned-rickshaw puller in the world who has more than 10 books and 100 essays published in his name. 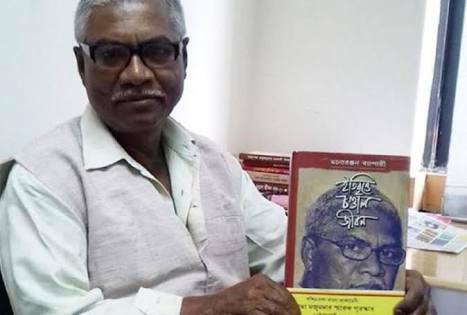 He is reportedly the first Dalit writer of West Bengal. Reading became his source of empowerment. Even working as a rickshaw puller, he tried to learn and read anything that he could find. He came to prominence with the publication of his influential essay 'Is There a Dalit writing in Bangla?' in the 'Economic and Political Weekly'. His works include 'Golpo Somogro', a collection of 22 short stories, a biographical fiction based on famous Namasudra of 19th century Bengal, Harichand Thakur and other essays and novels. In Byapari's words, "I changed my surname so people would not know me as a Namashudra", which reflects the suffering he endured all his life. His writings expose the oppression of Dalits by upper castes. "I'm a Dalit by birth. Only a Dalit, oppressed by social forces can experience true 'dalan' (oppression) in life...", he points out and exposes the discrimination shown by upper caste officials of West Bengal in resettling refugees of East Bengal to Dalits. Recently, Westland Publications acquired the rights on 14 works and that may change his life. He has been struggling financially and working as a cook at a hostel for hearing impaired. Byapari was awarded the Suprabha Majumdar Prize in 2014 by Poschimabanga Bangla Akademi and Sharmila Ghosh Smriti Literary Prize in 2015. He says he is a 'chandal' in two ways -- by birth and by rage (krodh chandal). His 'JijibishaI' -- the will to live -- should be a source of inspiration for the oppressed and exploited classes.